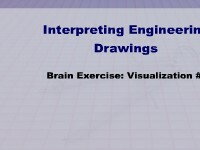 Learners examine pictorial drawings used in engineering including sectioned and exploded drawings. A sketching quiz is provided to help the learner create simple pictorial sketches by using orthographic views and an isometric template. In this interactive object, learners practice their 3D visualization skills by identifying the correct isometric view of an object. In this interactive object, learners answer 25 questions regarding part or assembly drawings. The basic areas of blueprint reading are covered. 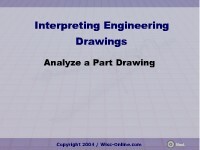 Learners examine the relationship of individual parts in an assembly drawing. 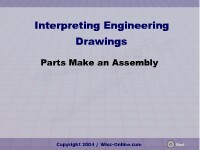 Assembly drawing notes, fabricated and purchased parts, and sectional views are explained briefly. 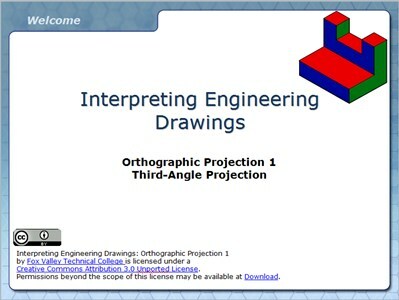 In this interactive and animated object, learners examine orthographic projection and the Glass Box Theory. Front, side, and top view development is demonstrated with pictorial views of each object to help develop 2D to 3D visualization skills. Learners examine the use of the tolerances displayed in a title block by calculating the minimum and maximum allowable size of a fabricated part. In a brief quiz, students determine whether a part is usable or should be scrapped. In this interactive object, learners practice their 3D visualization skills by identifying the correct isometric view of an object. Front, side, and top orthographic views are shown. Learners develop 3D visualization skills by examining front, side, and top orthographic views of objects. Using this information, students select the corresponding isometric view of each object. 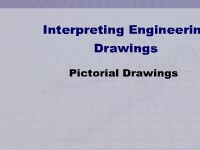 In this interactive object, learners examine sectional views used in engineering drawings. The sections shown are full, half, offset, aligned, revolved, and broken-out. 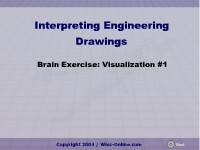 Learners match drawings of sectional views with the names of the views.